Hello from the very wet, misty and grey north! We had a dumping of wet snow last week, the temperature hovered around freezing and turned every little surface into ice. Getting out of the house was tedious. I usually wear spikes while walking during the icy months but have not bought a fresh set this fall and the ones from the last winter are truly worn out. Even the dogs had difficulties and their four wheel drive did not hold very well. When one of their legs went from under, they still had the three to hold the balance where poor me had it really bad. It is funny how age plays a role in this icy game these days, earlier when I fell, the first thought was always, did someone see me fall? while today it is humble, silent sigh: did something break? Never mind if anyone saw, actually, hopefully there is someone to help, if something did break. So far I have been very lucky. Thank you for the comments, they mean a lot to me and yes, they were my daughter's feet in the last post. 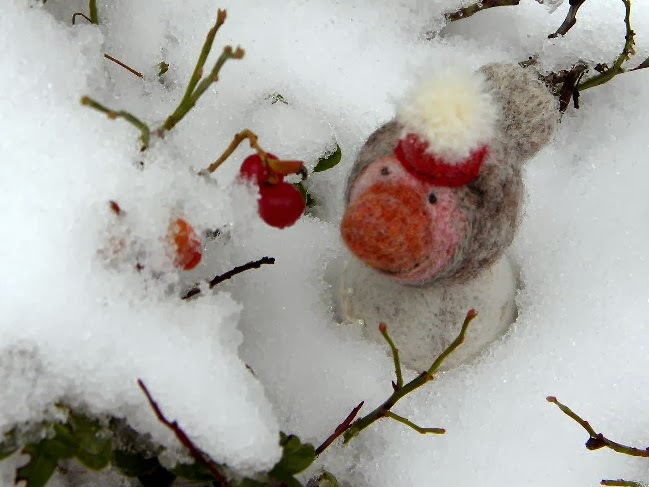 I crocheted a little doily and sewed it on with few beads to celebrate the first snow and to bring little bit of Christmas spirit, he has a red hat. I love making these little creatures, it is so different from the other stuff I make. It is like taking a trip into another world and I so enjoy being there that I almost don't want to return. I highly recommend needle felting. There is plenty of tutorials in Youtube if you'd wish to try it. Have I ever talked to you about my love for Marimekko. It just grows stronger every year. I grew up wearing all the different striped T-shirts when I was a kid and ever since I have bought fabrics and clothing, when it has been possible. There have been times when they have been far too expensive and I still buy carefully. 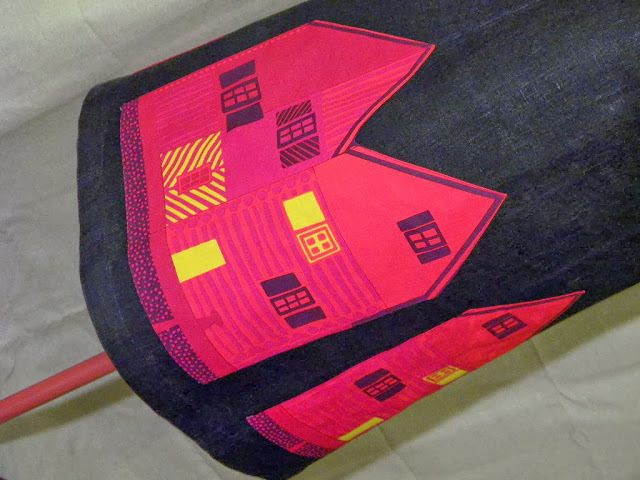 I am fortunate; we have a Marimekko outlet close by, I actually pass the shop every time I drive to town, and once in a while I just need to stop and get something. Sometimes it is just a small piece of fabric, but it never fails to make me happy. Add to these fabrics my love of sewing. 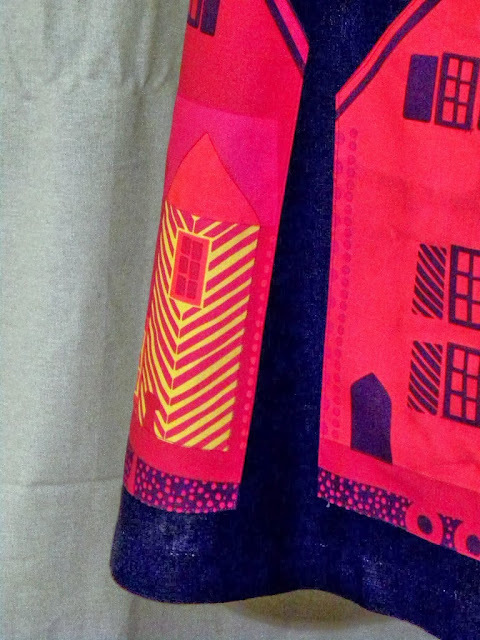 Marimekko fabrics have bold prints, and bold prints don't need fancy patterns which suits me just fine. I have sewn many dresses with this same, trusty pattern but with different prints and I love all of them and use them quite a lot. I plan to show them to you one at a time and here is the newest. 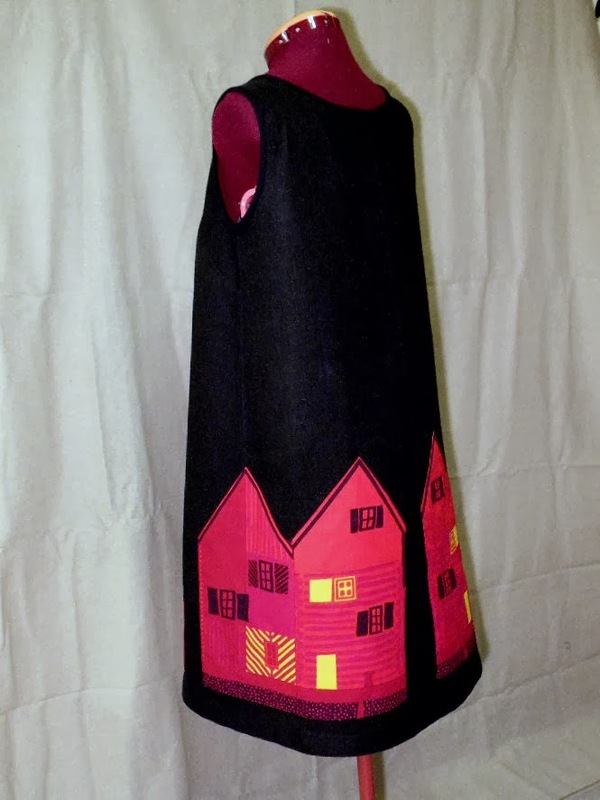 The dress itself is black linen but the houses are cut from a Marimekko print. I wear it with long sleeved black shirt and black leggings. The lining is dark green, I love to play with different linings. The length is fine for high or low heels, and it is the length that I feel comfortable in. I made my first dress already a few years ago and have been tweaking the pattern ever since and think it is close to perfect now. The dress is very easy to wear and forget and I am all about comfort these days (comes with age). 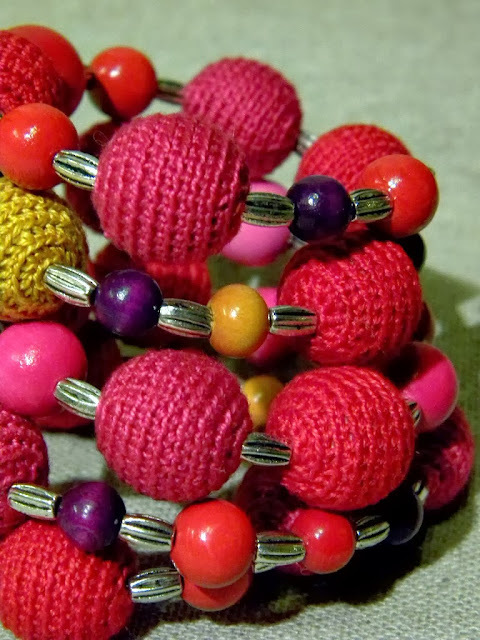 The dress inspired me to crochet red beads and I strung them onto a memory wire and now have a new bracelet. I am very pleased with this. It is fall... If you have been reading for some time, you know it is all about red in the fall. I would love to make black stockings with bold red stripes yet before I am done with this color. I've fallen in love with your bracelet! I can't see the missing bead, but if knowing it's not there plays on your mind, then definitely fix it...especially if its an easy fix. My favorite fall color is red, but that's also my favorite color. If I have to choose another color for fall, then I'll go with orange. Always good to see something new from you. My Fall color/s is on Hallowe'en, U.S. Route 1 in Charlestown, Rhode Island, the russet-red and brown of the oak trees that hold onto their dead leaves until spring, with the dark maroon-red of the sumacs, and a little bit of bright yellow on the horrible, invasive oriental bittersweet. Especially the russet-red. Such a charming bog entry- I had to smile reading it...your writing style is as unique as your handicrafts. By the way, my autumn colour is definitely orange. we need to see a photo of you in the dress with the bracelet, both are so cute, it is something my sister could wear very easily, but not me. When you show things that you have made for yourself, I always think they would look nice on my sister. LOVE the birds, so cute and fun, and as always, thank for sharing your unique and beautiful voice! 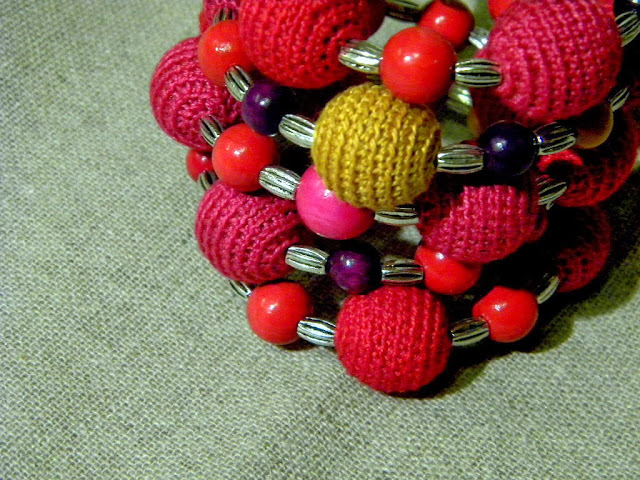 Hi Lene, I just discovered your blog and your wonderful design and crafting talent. What a joy to see and read your blog and pictures., WILL BE CHECKING IN NOW AND THEN just to get some inspiration. Love your sense of color also. I live in Charlestown, Rhode Island (USA) and agree with the comment by "anonymous" - I love the russet reds and the color of bittersweet during the autumn. My favorite year round color, however, is red - it always brightens a cloudy day and makes me feel happy! I have fallen head over heels with your dress - it's whimsical and exquisitely stitched! And your bracelet is a beautiful accessory -no one will even notice the missing bead! I love your sweet little bird - she's just charming! 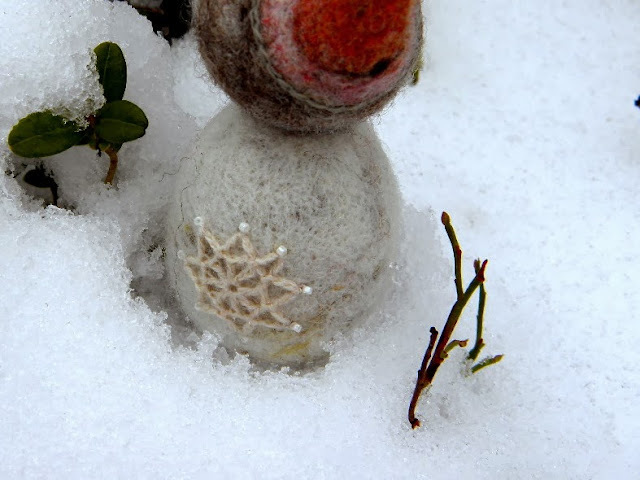 You've tempted me to try needle felting - thanks for sharing the tutorials! Your dress is just lovely! The pattern is very flattering. Is it a pattern that is readily available? I could have fun with that!!!!!! I loved red for years and recently changed to orange and browns. However! This year all I can see in any season peacock blue. So funny for me. I love marple leaves colors - warm red, green, yellow. I like the dress much! I have got a curvy body and its not easy to find a dress I could wear but this one looks really comfortable and looks so nice. Unfortunately Im not good in sewing, I make only very simple things like shopping bags or bed equipment. A good dress sounds like a rocket science for me. Oh! I love everything in this post! 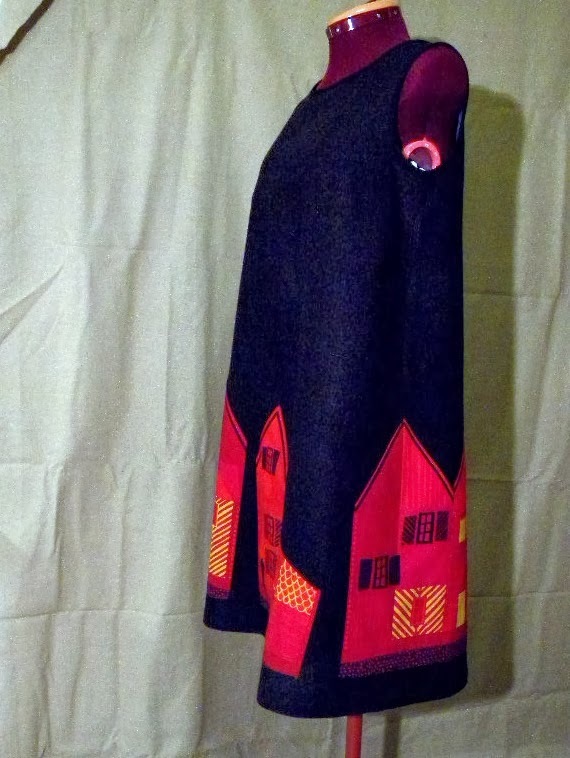 I too have a special fondness for Marimekko, and your dress is beautiful! A-line works every time. I'm patiently waiting for even the tiniest bit of snow here in the south (Turku), just to get that Christmas feeling going. My fall color is definitely all the colors of natural wool. At the moment, light gray and light brown are screaming to get on my needles. Such a bright post today, even if your weather is gray and dreary. 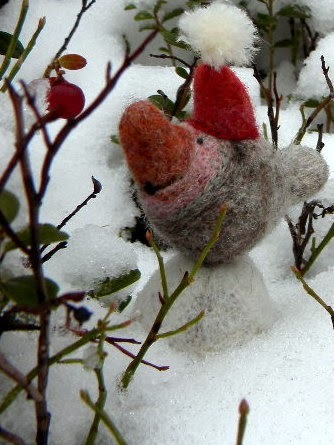 Love the felted bird, he is a beautiful work of art. Your dress is fantastic, perfect for so many occasions. And that bracelet is perfect, I love it. My favorite color this Fall is deep purple, yet I keep knitting with gray, what is up with that? Having just taken a tumble down some stairs, I absolutely agree with your perspective on age and falls! Did you know that when you bruise, it looks different when you are older! I look at my arm and see all of the elderly people I have taken care of over the years. Scary! 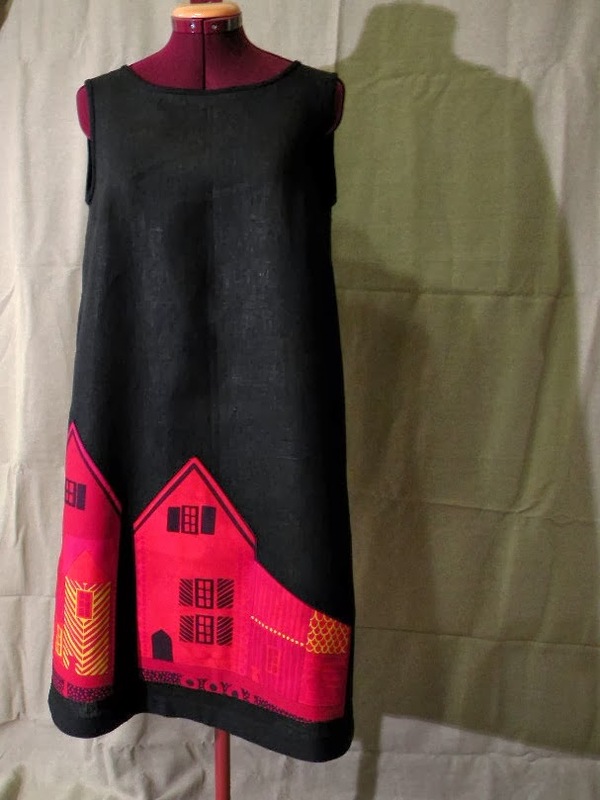 Beautiful dress; I might have to make one myself; I m a bit sick of pants. Your one-of-a-kind clothing is inspirational. 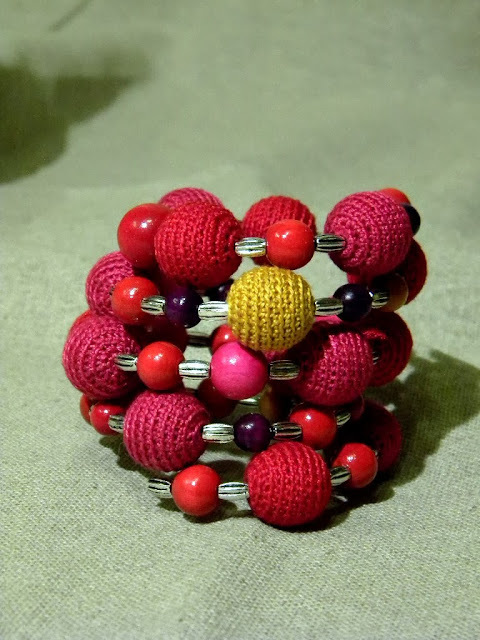 Your bracelets are also stunning; could they be knitted I wonder. Keep us posted, Lene !! You have a lovely blog, Lene. I would also like to know if the dress pattern is available. You never fail to put a smile on my face or in my heart. Your talent is amazing. Everything you make is so lovely. Pls. keep blogging. Another Rhode Islander here, chiming in to say how much I like your jumper. It looks very comfortable, and I love the idea of the blank canvas for decorating. I visited a new quilt shop recently, and while I'm not interested in making quilts at the moment, I can just imagine making a border on a plain jumper with those beautifully colored batiked fabrics. Thank you for the inspiration! Hi Lene, I just popped over from "Handmade and off-centered" to see what this wool passion was all about. Well, you have yourself a new devotee :D (follower). Someone who loves wool and who can sew! OMGosh all that talent wrapped into one person?! I wish I knew how to sew clothes... have never been good at it but now I can come over and drool at your latest creations! Yeay! I love your way if describing the world and your projects. I had a Marimekko duvet and shams when first married some 30+ years ago! I bought it full price I loved it so much...it was quite expensive but lasted for years. My colors are deep reds and greys. All lovely, but the dress is truly spectacular! You found a way to take full advantage of those adorable houses! My favorite fall color is a rich orange -- a fleeting moment on our trees in a Wisconsin fall. That dress is gorgeous, and your idea of adding Mari fabric onto linen is genius! And I just love your whimsical little creatures; makes me want to make some out of my leftover unspun fibre. My favourite year-round colour is red and just about any shade of blue. And natural grey sheep wool colour :-) The maples here light up in the fall and I find ALL their colours just so beautiful. My late autumn colors are mostly the russets and goldeny-browns, with some deep green as a counterpoint. I am surrounded by this combination every day now, and even when it rains (like yesterday and today) the colors have a warmth. I love your dress! I am a very, very beginner-level seamstress, but soon I will be sewing a new pattern that I hope will become a comfortable favorite, to be made over and over again. Fingers crossed! I just love your dress with that Marimekko print. I have been thinking about dresses all week - since I saw Sonya Philip's "100 Dresses" and now this, your wonderful post. Your jumper is fabulous. It makes me happy - it makes me want to go home and sew. I am loving purple these days - the deepest purply almost maroon - hard to find. i think you have found the perfect dress....i love it....and if my sewing machine cooperates, I'm might try to copy it.....in grey of course. (grey is MY color of the moment).